In this tutorial will find everything you need to know about web hosting services. The article will give you, necessary knowledge for create own website. Now reading the web hosting starter guide. Professional and clear explanation of the topics from hosting experts. Edited by team of copywriters. The article has been tested for readability and comprehensibility by 117, randomly chosen people. Their feedback was used for improvements, before publishing the material. If there is anything unclear or you notice inaccuracies, contact us. We immediately will fix it. Our goal is to give you clear and accurate knowledge. The "NextPointHost" differentiated from all misleading or fake tutorials written by most of competitors or their affiliates, with idea to trick you, to buy service from specific provider. Don't be surprised, if in the next lines read about things, that no one else writes about. They are the truth. This is the opposite side of the medal that nobody wants to talk about. At the left navigation menu you will find links to additional useful articles, that will help to configure your website and use the web hosting tools in the best possible way. What is web hosting and how to make use of it? Why do I need web hosting service? Which kind of website do you want? Which hosting technology do you need? Shared, VPS or Dedicated Cloud hosting? Why should I choose NextPointHost web hosting? Web hosting service, allows individuals and organizations to make their website accessible onto the Internet. In order for your website to be available to anyone at anytime, you need to host it with a web host. In other words: you need a web server leased to you by a web hosting company. Also, in order for your visitors to easily access your site by name, you will need a domain name such as `your-domain.com`. This will allow to make your site available at `www.your-domain.com` (for example) but this will also allow you to send/receive emails on addresses like `[email protected]`. Websites are hosted, or stored, on special computers called servers. When Internet users want to view your website, all they need to do is type your domain name into their browser. Their computer will then connect to your server and your webpages will be delivered to them through the browser. Registering a domain name, such as your-domain.com. Using this domain name for serving a website such as https://your-domain.com. Tools for easy website creation with 1 click installer. Using personalized email boxes by your domain name, as [email protected]. Others - backing up your important data online, support chat / voice services and so on. 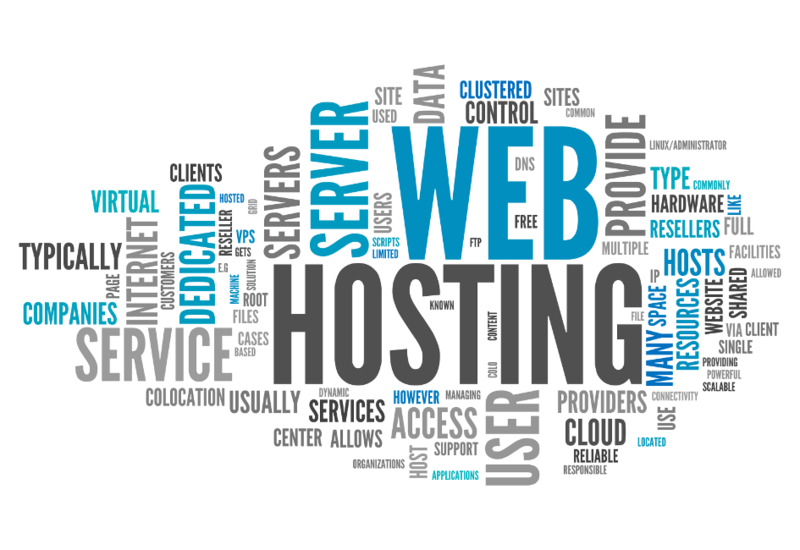 In order to have website available in the World Wide Web, that you can call your own, you need to invest in hosting. Fortunately, it doesn't even cost that much to have your very own piece of online real estate. The web hosting as a service incorporates the secure space where your website files are stored, the traffic to your website, and lots of extra services such as firewalls, technical assistance, email services, FTP access, domain name registration, website building tools and etc. So if you're serious about building out of own website, avoid free platforms like Blogger or Tumblr. There are plenty of horror stories online about site owners having their profitable websites taken down for breaking a certain rules or conditions of these free platforms. Even if your website does get back online you’ll end up losing crucial sales during that time period. Another issue with free platforms is co-branding. In other words, your website shares branding with the free host. This lessens your credibility with customers, and impacts the overall look and design of your site. When you use a free option you won’t be able to expand or customize your site as you wish. You’ll have limited access to plugins and tools and the growth of your site will be limited as a result. Plus, in case that pay for your hosting will receive 24/7 expert support too. You'll have someone that can contact immediately if you ever run into an issue. The domain names are easy-to-remember words that you can use as unique name of your site, with which your visitors will find your page, e.g. google.com and yahoo.com are domain names. Click here to learn about domain names we offer. Static sites (simple sites): you need to build one or more web pages with software like DreamWeaver on your computer. Then need to upload the pages to your host’s server using FTP software like FileZilla for example. Every time you will need to change something on your site, you will have to edit the pages on your computer and upload them again. The website never changes by itself. That’s why it’s called a “static” site. If installing a web application sounds complicated, don't worry! NextPointHost automatically will install the application of your choice with one mouse click. Our 24/7 tech support also will help you, at case of need. Linux hosting: Today, this is by far the most commonly used system. All known web applications, as WordPress, Joomla, Drupal, OpenCart, Magento, PrestaShop, WooCommerce, and many others, used it. Based on our many years of experience, this is the best technology for building reliable web sites. If you hesitate what to choose, we strongly recommend you - Linux. Windows hosting: this is also known as .NET or ASP hosting. Both ASP and .NET are Microsoft’s proprietary technologies for web applications. These technologies are used only by custom made web applications, written on Active Server Pages (ASP) or .NET Framework. In case you don't plan to invest thousands at the development of your site by a team of costly developers - forget about this technology. IMPORTANT Note: Don't confuse the operating system on your local Windows computer or Mac with the technologies used by your web server. All web pages served by Linux servers can be opened from any devices, no matter which operating system you use. For example current article comes from Linux web server. You are reading it without problems and without matter that the your device use other OS. The Linux hosting is generally faster, cheaper and more flexible than Windows hosting. Before you make a decision, you need to understand what your hosting needs are, as these hosting services differ in terms of features, performance and price. Shared Hosting - Most people's needs fit in that popular solution. In a shared hosting environment, several websites are put on to a single server. This way, the web host reduce its cost, and services are cheaper. Ofcourse, has and drawbacks in terms of performance and configuration flexibility. For example, if your application has a specific server requirement you shouldn't expect the shared server to be re-configured to meet your needs. Additional limitations can be applied about used disk space and bandwidth. The performance of your website is largely affected by the needs of the other websites, as you will be sharing the same server resources. This hosting service is ideal for websites that do not require a lot of bandwidth, disk storage or CPU consumption. Virtual Private Server - The Swiss Knife in the hosting! Receive faster performance and full control over the server. All that on very good prices. That service divides very expensive, high end physical servers with many resources to smaller pieces. The pieces are named virtual private servers or VPS. Each customer have own virtual server. On this small server is installed own operating system. Unlike shared hosting, VPS doesn’t share memory or processor time. Here everyone have allocates certain amount of memory and CPU to use. That's means the problems inside VPS on the same physical server will not affect other customers. Each websites is like hosted on own dedicated server. It's quite affordable, fast and stable solution, suitable for websites that need greater control at the server level, but don’t want to invest in a cloud hosting. Additionally, virtual servers can be used for everything that require server resources. For example on VPS you can create own shared hosting server and to sell shared hosting plans. You can host business applications which aren't related with websites, like file server, print server, backup server, VPN server and etc. The possibilities are unlimited. Find more information about VPS here. Dedicated Cloud hosting - the newest and most reliable type of hosting. The state of art technology that offers unlimited ability to handle high amount of traffic. Here’s how it works: a team of servers (called a cloud) work together to host website or bussiness application. This setup allow you to scale your resources near to infinity. If you plan to create big website or have bussiness applications that needs a custom server (or two) working with load balancing or other special requests, this is the most suitable solution. The cloud hosting is fully managed and crafted per you requirements, be it a single instance setup, a public or private cloud configuration or a geographically dispersed cluster architecture. It have many advantages versus all other hosting types. Read more about Dedicated Cloud Servers, at specially created section of our website. NextPointHost web hosting services are specially designed to provide you with an All-Inclusive web solution. In addition to the web hosting services, we get you the easiest tools which will help you start your own website - be it a personal or family page with photos, a presentation of your company, a website for your online community, or even an online store. Once you sign up for a hosting account, you get full access to any of the tools, described above, and you can start building your web pages within minutes! read what the experts say about NextPointHost at independent publications. find NextPointHost user reviews here. Recognitions of NextPointHost as Best Quality Web Hosting. We hope the article gave you a good overview what "Web Hosting services" are and how they works? It's designed to helps entrepreneurs, web developers, SEO optimization firms, internet marketing agencies and freelancers to extend their knowledge. In case you have any additional questions, feel free to submit them as comments to us. In case that article helped you to answer some of your questions, Share it inside all social networks! Share it inside the forums. Share it into websites. Let all people know, how valuable the article is! That simple step will help us to provide you more articles in the future. Thank you for the support!